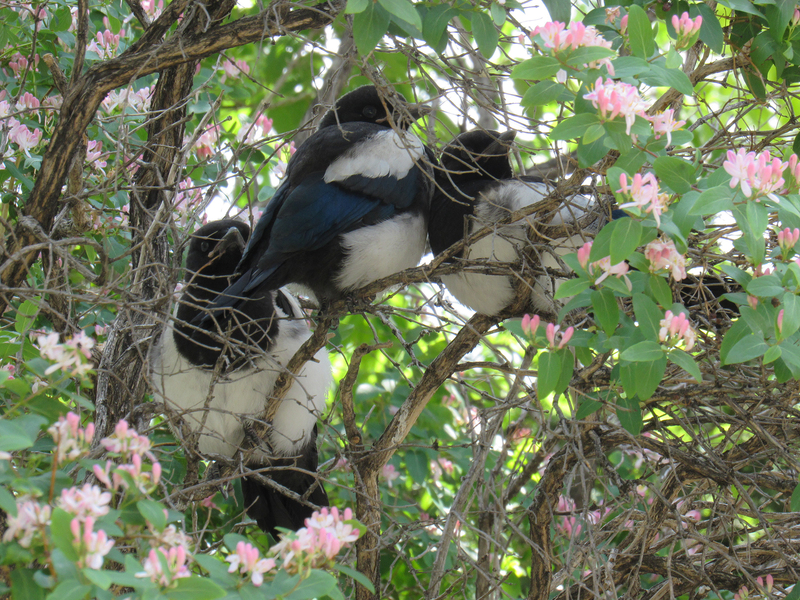 I saw my first young black-billed magpies (Pica hudsonia) on May 24 2016 in a Tatarian honeysuckle bush near Parking Lot 10 of the University of Calgary. One sibling was on his own and the three others were together. A few days later, on June 4th, I saw youngsters from another family, a couple of blocks away. Black-billed magpies build very large spherical or oblong-spherical nests with two, small, round openings on opposite sides. 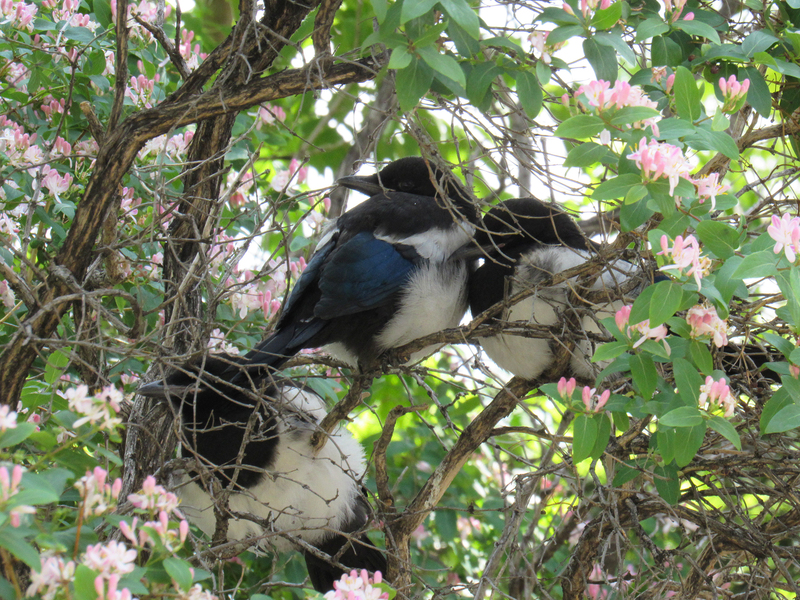 I’ve seen a lot of magpies and their nests around Edmonton but I haven’t seen any young ones yet. 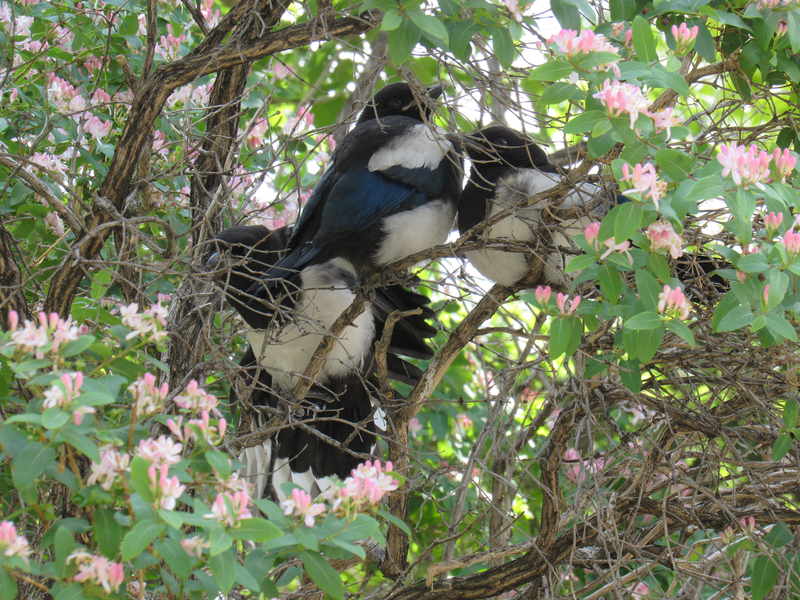 Below are some photos I took last year, in Calgary, of adult magpies and nests. 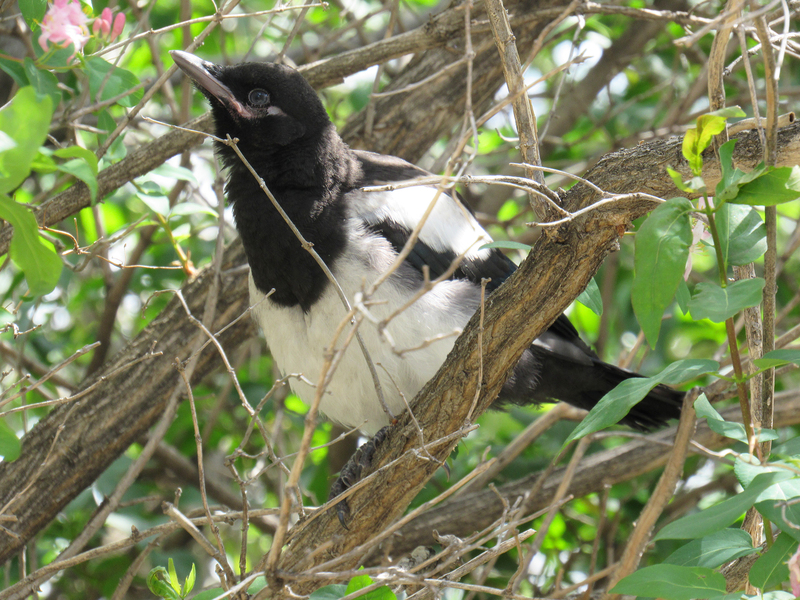 Adult black-billed magpies have black bills and much longer tails. A black-billed magpie near his nest on April 3rd 2016 in the Inglewood Wildlands. I think he is Mr. Magpie and Mrs. Magpie is in the nest with the eggs. Mrs. Magpie does all the incubating and Mr. Magpie brings her food. Most black-billed magpie nests I’ve seen were high up in large trees. This old, unused nest in the Inglewood Bird Sanctuary was in a bush, at eye level, so I got a peak at the mud cup inside. A closer look at the mud cup. This old nest in the Inglewood Wildlands lost its top. Lots of dry mud on the bottom! A black-billed magpie collecting mud for its nest at the Children’s Hospital Pond, on April 5th. The magpie and the goldeneye are on Gwyndolyn’s nesting island. Magpie in flight over the Bow River, Bowmont Park, March 5th 2016. So cute! Love that you got pics of them in the flowers. How exciting to see fledglings! I’ve only seen adults. They look so pretty with the pink flowers. I have to tell you I find these birds gross. They’re my least favorite bird. Do you find magpies gross because they cache dog poop? I’m sort of divided on it being interesting and it being gross. I’ve never seen them doing it so I can just pretend they are all pretty, all the time! How exciting seeing the magpie and robin fledglings! I’ve never seen either, but did see a Western Bluebird Fledgling last week. I even got a decent image. That was exciting. Magpies- yes! I’ve never seen them stashing poop but I see them digging through cow and horse dung and eating stuff from it. GROSS! They’re the flies of the bird world. ICK! Very cool. I didn’t know about the nests. We only see them when wed go to the other side of the Cascades, and I’m always happy to watch them with those elegant tails and the handsome plumage. 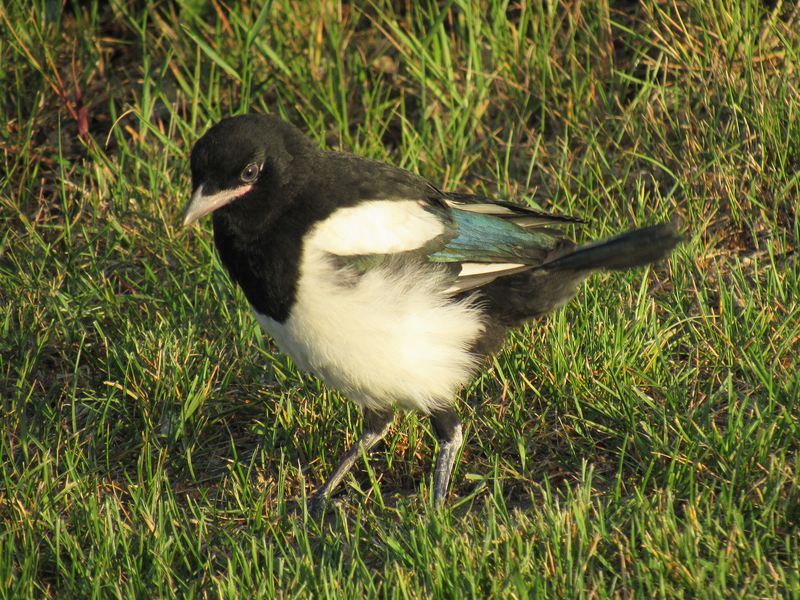 I guess you could think of magpie fledging as being at the same time as lilac fading! Those animal/plant timing associations seem to work better than calendar dates. Thanks for the information! Good observation about the animal/plant timing associations. My visual memories tend to be stronger than my factual date memories. 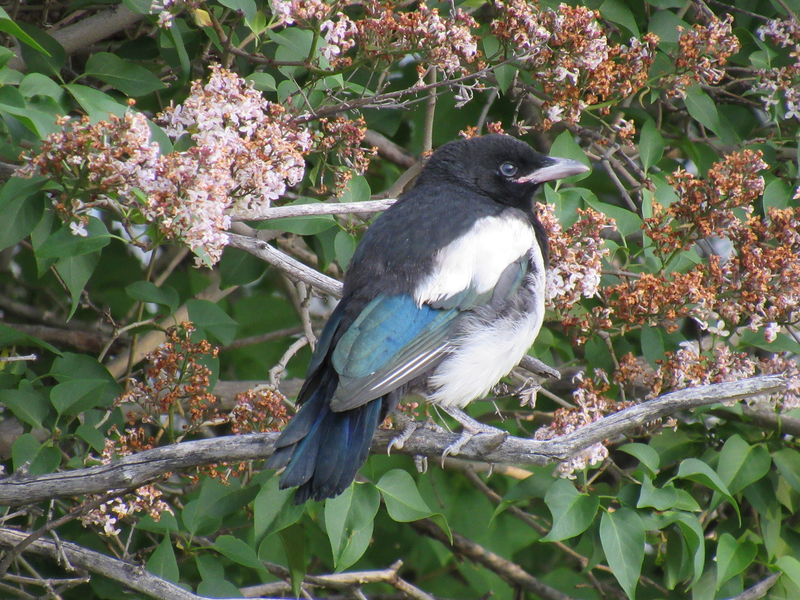 And indeed, as the first lilac bushes started to fade last week, I saw my first three magpie fledglings. So delightfully awkward and energetic! Salut Seb! Merci pour tous tes super commentaires. I’m working on verbiage for educational kiosks for Mueller State Park in Divide CO. I’m currently gathering information on Magpies. You have a great photo of a Magpie nest that I would like to ask your permission to use on our kiosk. You would receive credit for the photo. Thank you for your time. Previous Previous post: Western Grebe!